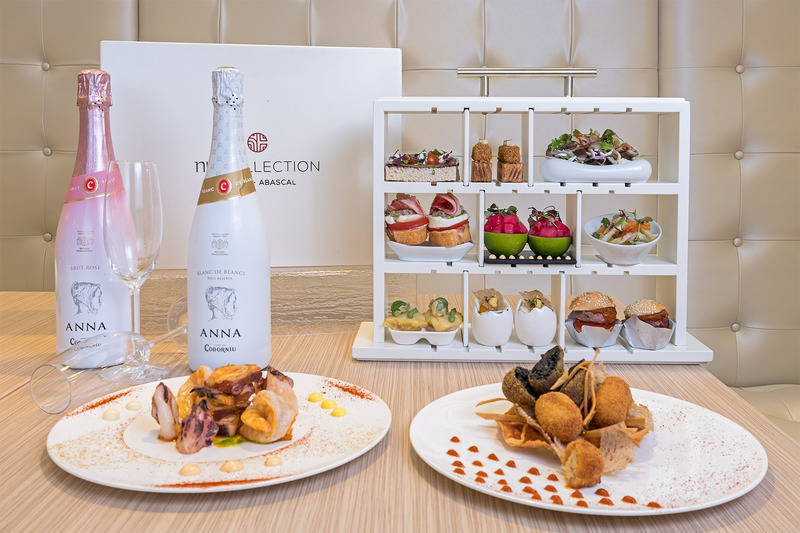 The hotel offers a new version of its well-known The Box, an original tasting menu with more than fifteen gastronomic proposals in small format on a menu designed by Paco Roncero and prepared by the hotel’s executive chef, Ángel Aylagas. The menu is offered from Thursday dinners to the last service on Sundays, from 13-16h and from 20-23h. Served in a special box-shaped format and designed ad hoc for the Domo Abascal restaurant, The Box offers avant-garde cuisine in a very original presentation. The Box offers more than fifteen proposals, among which are several starters, nine tapas and a dessert, currently with two original options of pairings proposed by the Director of DOMO, Nuria Martín. The first one, with a selection of splendid cavas by Anna de Codorniú and another one with vermouth, beer and glass of wine, 100% from Madrid. The menu starts with a Madrid-style vermouth that accompanies the starters, which under the heading of Abrebocas, allows you to taste bread sheets flavored with picual, arbequina and cornicabra oil, Salmorejo with fresh cream of kafir lime and roe of herring, a Verbena croquettes on corn tortilla with chipotle sauce as well as a perfect combination of octopus, squid and grilled prawns with spicy Andean. You are followed by nine tapas in a disruptive arrangement within the gastrocaja of surprises, such as the toast of marriage in brioche bread and its tapenade, ingot of foie, crust of bread of five spices, Tiradito de bacalao, with its jalapeño bilbaína, Pizza margarita with walnut pesto and basil, Kimchi with scallops over lime, marine salad with gulas, shitake and garlic prawns, Roman hake with Padrón peppers tempura, oxtail stew with boletus and quail egg and beef burger, with japo barbecue. The final, always sweet, is currently made up of a selection of sweets and pastries along with various sugar and fruit caprices.